We are excited to announce that Sealed Air’s efforts to reduce greenhouse gas (GHG) emissions and mitigate the risks of potential climate change have been recognized by CDP. 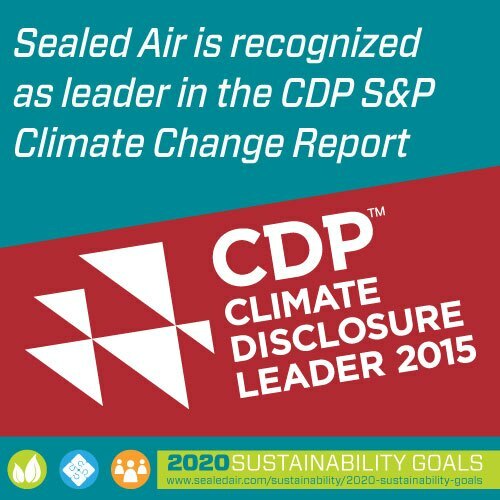 As stated in this year’s CDP 2015 Climate Change Report, Sealed Air was named to the Climate Performance Leadership Index (CPLI) A List and also received a 100 percent Disclosure score, earning a position in CDP’s S&P 500 Climate Disclosure Leadership Index (CDLI), for the second consecutive year. CDP is an international, not-for-profit providing the only global system for companies to measure, disclose, manage and share environmental information. Through the global system of CDP, companies are better able to mitigate risk, capitalize on opportunities and make investment decisions that drive action towards a more sustainable world. Measurement, management and disclosure of GHG emissions and climate change data are increasingly important aspects of sustainable business practice. An integral part of Sealed Air’s sustainability strategy is focused on GHG reductions, reducing operating costs and risk, and generating value through solutions that reduce waste, conserve energy and water, and optimize the use of raw materials for its customers. Earlier this year, the Company announced its 2020 Sustainability Goals, which are an aggressive set of targets and commitments to drive the continued strategy for mitigating the risks of climate change. Sealed Air achieved the maximum score and A rating by reducing its energy intensity and GHG emissions while maintaining customer value and cost competitiveness. Sealed Air teams are actively sharing footprint reduction best practices in sustainability projects across all sites. In 2014, 39 projects to reduce energy & GHGs were implemented, with an estimated reduction of more than 30,000 metric tons of CO2. Projects include lighting, upgrades to compressed air systems, boiler upgrades, replacement of chillers, recovery & use of SF6 (a highly potent GHG), low carbon energy installations, and behavioral change programs. Our recognition on the CDP Climate Performance A List and the CDLI is important not only to internal stakeholders but our customers and external partners as well. “We are developing products with lower energy and GHG impact when in use, which is critically important to many of our suppliers and customers, and assists them in achievement of their own goals. In 2014, some examples of those new innovations with lower energy and GHG impact for customers included Freshness Plus, Darfresh On Tray, and Smart Mix Pro Series. Sofitel Mumbai, a luxury hotel in India’s Mumbai business district, is just one customer that has benefited from some of the work featured in Sealed Air’s CDP submission. The hotel, situated in a region of extreme water scarcity, partnered with Sealed Air’s Diversey Care in an effort to reaffirm its responsibility to sustainable development and environmental efficiency. After switching to the Company’s Clax Advanced® laundry solution, the hotel immediately noticed cleaner, whiter linens on the first wash with less energy consumption in the process. After studying the results during one year of use, Sofitel Mumbai realized 42% reduction in water consumption (7.8 M liters) and 28 Tons reduction in CO2 emissions over their previously used laundry solution. The work that Sealed Air is doing in climate change mitigation also has a broad impact for the world and the local communities the where the Company operates. In addition to on-site business practices and new innovations, Sealed Air actively partners with Trade associations and third parties to conduct research and to advocate and influence climate legislation. Some of those groups include WWF EUROPEN, AMERIPEN, BIER, CGF, and GEMI. This year, approximately 2,000 companies reported to the CDP Climate questionnaire. Company disclosures to CDP are scored on a scale of 0 - 100 for completeness and data quality. This year, Sealed Air scored 100 for Disclosure and achieved an A rating on the Climate List, one of only 113 companies accounting for the top 5% of those reporting. High scores indicate that companies provided robust climate data and conveyed a strong understanding of corporate climate-related issues. Companies in the top 10% for Disclosure scores are awarded a position on the CDLI. CDP Disclosure scores are provided to investors and other decision makers through various channels, including Bloomberg terminals, to help them assess corporate preparedness for changing market demands, current and future emissions regulations, as well as current and future physical risks and opportunities associated with climate change. For more information on Sealed Air’s sustainability commitments, visit our website. CDP’s annual global climate change report, along with the climate scores of all companies publicly taking part in CDP’s climate change program this year, is available on CDP’s website. In his position as Vice President, Sustainability, Ron Cotterman is responsible for Sealed Air’s company-wide sustainability strategy. In this global role, Ron leads initiatives in operational excellence, delivering customer value and achieving Sealed Air’s vision to create a better way for life.